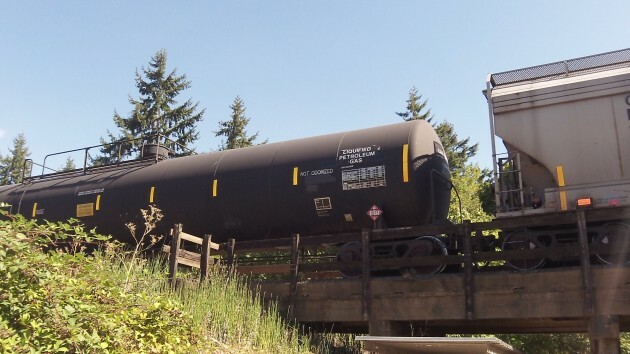 With news photos of controversial oil trains on my mind, I took a closer look at this tank car. It was part of a batch of rail cars the Portland & Western was shifting back and forth at its Millersburg yard on Tuesday afternoon. And no, it was not an oil car at all. Instead, being shunted high above the Cox Creek Trail, it was marked to carry liquid petroleum gas — otherwise known as propane. So, what about liquid petroleum gas or propane? It’s a fossil fuel too, being produced at either oil refineries or natural-gas process plants. But for some reason it has escaped the ire of the global warming fanatics. The Port of Portland just announced plans by a private company to build a huge propane terminal. Not only did nobody protest, but the Portland mayor actually hailed it as a great economic benefit. A few months ago the Benton County Sheriff’s Office announced it was converting its patrol cars so they could run on propane as well as gasoline. One reason: Lower emissions when running on propane. How dangerous is propane? Evidently a lot less so than crude oil in a long train that is parked on a grade and allowed to come loose overnight and careen toward a little town below, which is what happened in Quebec. In 2001, the propane industry published a comparison of risk. The chance of dying in a propane explosion came out as about the same as being killed on the ground by a falling airplane: One death a year, on average, per every 37 million people. When one considers all of the various, sometimes extremely hazardous, chemicals these trains carry, I really don’t see why petroleum is singled out other than a political agenda. This is not, repeat not meant to mock your article. And for the record I’m not against transporting fossil fuels by rail if required. But I’m fairly sure comparing the safety of a tank car of crude to a tank car of pressurized propane is sort of like comparing green peppers to habaneros. A tank car of crude oil is pressurized to 0 PSIG. They’re actually vented to relieve any very minor pressure increase due to possible heating of the oil while in the tank. Open the tank lid and you’ll see nothing but black gooey crude oil. On the other hand. liquified propane must be refrigerated to minus 44 degrees or pressurized to keep it liquid. Since refrigeration is expensive, shippers rely on pressurized tank cars to keep the propane liquified. At 110 degrees (a temperature easily reached in a black tank on a hot summer day) the pressure inside a tank of crude oil is about 0. However, propane will remain at a pressure of 197 pounds per square inch to keep it liquified (this pressure rises and drops as the temperature of the liquid does). Open up the tank lid (not that it actually has one) and what will you see? Absolutely nothing, since you’ll probably be dead since the release of pressure will immediately allow the propane to return to a gaseous state. Read boil away; and if there is an ignition source explode. So tank car per tank car liquified propane is much more dangerous than crude oil. It’s just that you’ll never see a train of 150 liquified propane tank cars headed down the track. Yes the accident in Quebec was tragic, but that’s caused a seemingly knee-jerk reaction to the thought of transporting crude oil via tank cars. However could we avoid transporting all that oil via trains?????? Does the term pipeline come to mind? Nahhh that would make too much sense.